I read this back in February for the Age of Innocence read-a-long hosted by bookworm meets bookworm, and, in true overbooked fashion, managed to post my Part I thoughts on time only to miss the Part II posting by 6+ weeks. But, to be fair, I did read the book on time. In understanding this, Archer is then faced with a decision: conformity or noncomformity. He must choose between his place (and his duty) and his whimsy (and illicit love). It is an eminently familiar situation: that battle between what we feel we must do and what we wish we could do; the contest between who we are and who we thought we would grow up to be; the struggle between making ourselves happy with what we have and longing after what we might have had. "His days were full and they were filled decently. He supposed it was all a man ought to ask. Archer's tale is sad but not without hope; he is disappointed, and somewhat disappointing, but not to an extent that he becomes despicable. He, like so many others, has set out to do what he believes to be the right thing, and upon making his decision, is resigned to living with it. He does not buck (too much) or complain (too often). In that, he is actually rather stoic. Though it is tempting to view him as weak, does it not take some courage to give up a dream in the face of responsibility? And to accept the consequences that accompany it? Despite some readers' disappointment with the final pages (and at a risk of giving away too much), I believe Archer's actions are instead a perfect reflection of his character: steadfast, courageous, dutiful, aggravating. 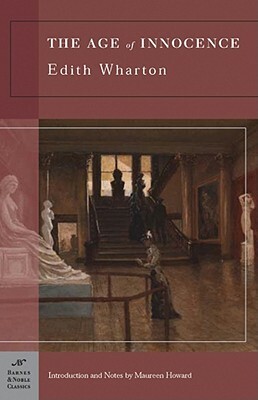 Bottom line: Wharton's Age of Innocence is the kind of novel that has sat on the edge of my consciousness for some time without me ever really focusing on it. Now that I finally have, I find it is also the kind of novel that is eminently quotable, easy to relate to, and transcends the both the era in which it was written and the era about which is what written in that perfect way that those books we deem "classics" tend to do. I thought that Archer was an interesting character--but also showed to be somewhat of a jerk. Overall, I really like The Age of Innocence. I have Ethan Frome sitting on my TBR shelf. I'm so glad you liked the ending as well! I thought it was perfect. Well, despite it being 6 weeks after, I am so glad you posted this. I completely agree and I love your statement about having an idea of who you want to be and who you end up being. It's quite poignant. It's really a story that speaks to people each generation since the novel was written, something we can all relate to in someway. I was especially thrilled at the intensity in which Wharton relates New York society at this time; I feel I learned so much about the "new" American aristocracy through the work. I am so glad you participated! And I'm glad you enjoyed the novel! I was certainly impressed with the amount of discussion it prompted- another reason why I love book blogging so much! Another classic I have to get to. great review! I started this for the Read a Long but didn't finish (not because I didn't like it but because other things came up). You have inspired me to pick it back up!